Persian cats and some other breeds are brachycephalic; "Brachy" means "shortened" and "cephalic" means "head". The skull bones of brachycephalic cats are shortened in length, giving the face and nose a "pushed in" or "flat" appearance. Due to the shorter bones of the face and nose, the anatomy and relationships with other soft tissue structures are altered. These breeds can be subject to teeth and jaw problems that can include crooked teeth. Sometimes baby teeth can be crooked but the adult teeth grow in normally. Other brachycephalic breeds include: Exotics, British Shorthair, Himalayan, and Scottish Fold (as well as many dog breeds). The entire area of the mouth is referred to as the "jaw" and consists of the Maxilla (the upper jaw) and the Mandible (the lower jaw). When the upper jaw protrudes it is referred to as "overshot" (dental term) or an "overbite" (layman's term). If the lower jaw protrudes it is called either "undershot" or an "under bite". In animals with an overshot or undershot jaw this condition is also known as "Asymmetrical Jaw", meaning the jaws are not identical (one is longer than the other). While not as common in the Persian breed, a twisted mandible can happen whereby the two jaws do not touch each other and the teeth may protrude outside of the lips. Sometimes causing the teeth to penetrate the roof of the mouth, jab, or poke the gums in different places. Redness and inflammation in the gums because of trapped food between the teeth. Again, this is because the jaw is not properly aligned. Soft tissue trauma around the canines. The animal's gums can be red and/or inflamed, and sometimes lesions in the soft tissue area can result due to friction and pressure of the teeth. In extreme cases, the canine teeth can also erode the palate and cause food to enter the nasal cavity. The constant rubbing of the teeth against each other may eventually wear down the tooth enamel and cause tooth breakage. Difficulty chewing and eating. In severe cases, malnutrition could result. A dental veterinarian (this is a specialist, not a regular veterinarian) can apply rubber bands to the cat's teeth to bring them back to normal alignment. Retainers and other devices can also be used. Personally, I would never go to this expense. If outside trauma has occurred (such as a fracture to the jaw due to an accident), then a dental veterinarian can wire the jaw to correct the misalignment. Tooth removal. I have had a lower canine removed that was making an indentation on the upper soft-palette and would eventually cause an open hole. PLEASE NOTE: The treatments described above are for "EXTREME" cases where eating or chewing are impaired due to the misalignment of the jaws or crooked canine teeth. More often than not, an Asymmetrical Jaw does not require any outside intervention. It is very important that owners pay close attention to a young kitten's teeth and the alignment of their jaws prior to their adult teeth coming in. Development of a potentially incorrect bite (Asymmetrical Jaw) may be corrected by the simple removal or clipping of the upper or lower canines (depending on whether it is undershot or overshot). Retained baby teeth can also cause misalignment of the jaw or crooked canine teeth as the adult teeth come in. 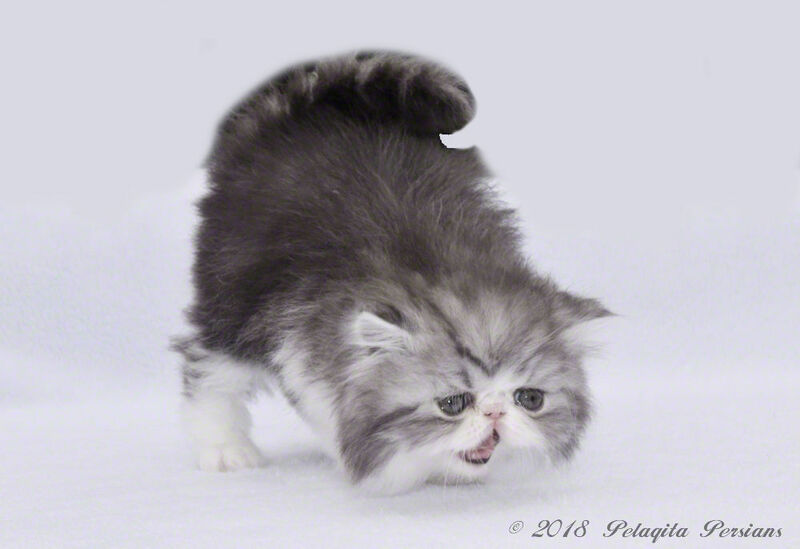 Additionally, since jaw and bite issues are linked to the nature of the brachycephalic facial structure in the breed, a "doll" faced Persian (and Himalayan) kitten can also have these same issues.